In the tradition of the bestseller, “A Holiday of Love”, comes this collection of Christmas treats from four of today’s most beloved romance authors–Virginia Henley, Brenda Joyce, Fern Michaels, Jo Goodman. In a remote case on a windswept island, an America beauty tames a wild and magnificent Irish nobleman… and finds after innocence comes passion—and a very special Christmas Gift. Did you know “The Miracle” appears in two anthology novels? 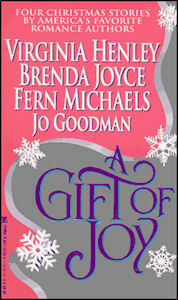 They are A Gift of Joy first published in 1996, and Five Golden Rings published in 2000. It was Christmas Eve, and Lisa had never been as miserable or frightened in her entire short life. She was hiding from her fiancé, the Marquis of Connaught. She had run away from him two months ago, on the night of their engagement party. But now she was desperate. She did not know how much longer she could continue to hide like this, alone and cold and hungry—and so terribly unhappy and afraid. Lisa shivered. She was wrapped in a mohair throw, for she was only wearing a white poplin summer dress. When she had fled her engagement ball, she had fled without any clothes except for the evening gown she was wearing. That had been discarded immediately. And it was frigidly cold outside, the sky dark and threatening, and has freezing inside her parent’s huge summer home. But she did not dare make a fire for fear or alerting a local resident or a passerby to her presence, for fear of alerting Julian St. Clare to her presence. Tears did not come to Lisa’s eyes, however. On that night of her engagement party she cried so hard and so thoroughly that she doubted she would ever cry again. Julian’s betrayal had been a fatal blow to her young heart. How naïve she had been then, to think that such a man had come courting her out of love and not more sanguine reasons. He had only been interested in her because she was an heiress. He did not want her, had never wanted her; he only wanted her money. A loose shutter began banging wildly against the slide of the house. Lisa was huddled on the floor in a corner of her bedroom. The shutters there were open, as were the blue and white drapes, so that the faded winter light could filter into the room. The house was low on supplies. Although there were gaslights, Lisa dared not use them, using only candles. The candles were all but gone. She was almost out of food, too, as there were but a few canned items left in a pantry. Yesterday she had begun using the last bar of soap. Dear God, what was she going to do? Lisa wiggled her toes, which were numb from the cold. She stared out the window. It had begun to flurry. Even though the window was closed and made of double-paned glass, Lisa could hear the thundering of the surf on the shore not far from the back of the house. It was Christmas Eve. Lisa imagined the cozy family parlor on her Fifth Avenue home. Right now her father was undoubtedly poking the logs in the fire, watching the flames crackle, clad in his favorite paisley smoking jacket. Suzanne, her stepmother, would be descending the wide sweeping stairs. Dressed formally for supper. And Sofie, who had returned from Paris with her beautiful baby daughter, was she there, too? Lisa’s heart twisted. She missed her father and stepmother and stepsister terribly. A sense of loss swept through her; so acute it made her breathless and dizzy. Or was she faint from hunger and lack of sleep? Lisa slept fitfully at night, her dreams deeply disturbing. As if she were a child, she dreamed of being pursued by monsters and beasts. She was always running in terror, afraid for her life, for she knew if the beast caught her, he would coldly, cruelly destroy her. He was a shaggy wild creature, horrific and not human at all. Until she saw his face. The beast always had a face. He was blond and grey-eyed and coldly patrician. He was devastatingly handsome. His face was Julian St. Clare’s.